Ploiești is the county seat of Prahova County and lies in the historical region of Wallachia in Romania. On the 2nd (Wed), see the interesting displays at Bellu Manor, see the interesting displays at The Clock Museum, and then contemplate in the serene atmosphere at Marea Sinagoga. Here are some ideas for day two: admire the landmark architecture of Curtea Domneasca (Corte Principesca), steep yourself in history at Chindiei Tower (Sunset Tower), and then contemplate in the serene atmosphere at Princely Church. To see more things to do, where to stay, other places to visit, and tourist information, refer to the Ploiesti trip itinerary tool . Porto, Portugal to Ploiesti is an approximately 13.5-hour flight. You can also drive. The time zone difference moving from Western European Time (WET) to Eastern European Time (EET) is 2 hours. Traveling from Porto in October, expect Ploiesti to be little chillier, temps between 20°C and 7°C. Cap off your sightseeing on the 3rd (Thu) early enough to travel to Brasov. Satisfy your inner culture vulture at Brasov Historical Center and Peles Castle. You'll find plenty of places to visit near Brasov: Bran Castle (Dracula's Castle) (in Bran) and Sinaia (Pelisor Castle, Sinaia Monastery, & more). There's much more to do: contemplate in the serene atmosphere at Black Church (Biserica Neagra), explore the historical opulence of Rasnov Citadel, take your sightseeing to a higher altitude at Mount Tampa, and pause for some serene contemplation at Catedrala Ortodoxa Adormirea Maicii Domnului. To see other places to visit, traveler tips, and tourist information, read our Brasov vacation planning app . Traveling by car from Ploiesti to Brasov takes 2 hours. Finish your sightseeing early on the 7th (Mon) to allow enough time to take a bus to Sibiu. Get some cultural insight at Old Town and Lutheran Evangelical Cathedral & Tower. Take a break from Sibiu with a short trip to Transfagarasan Highway in Curtea de Arges, about 1h 30 min away. There's lots more to do: make a trip to Big Square (Piata Mare), explore the ancient world of Turnul Pielarilor, see the interesting displays at ASTRA Museum, and snap pictures at Bridge of Lies. 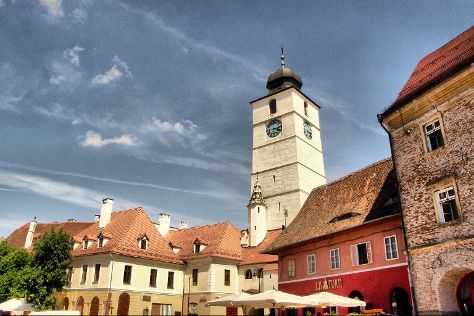 You can plan Sibiu trip in no time by asking Inspirock to help create your itinerary. Take a bus from Brasov to Sibiu in 2 hours. Alternatively, you can drive; or take a train. In October, daily temperatures in Sibiu can reach 19°C, while at night they dip to 4°C. Wrap up your sightseeing on the 9th (Wed) early enough to travel to Sebes. Kick off your visit on the 10th (Thu): take in the architecture and atmosphere at Sebes Evangelical Lutheran Church, take in the dramatic scenery at Clocota Waterfalls, explore the ancient world of Termele Romane (Roman Baths), then delve into the distant past at Colt Citadel, and finally explore the historical opulence of Fortress Câlnic. For ratings, reviews, traveler tips, and other tourist information, you can read our Sebes route planner. Drive from Sibiu to Sebes in an hour. In October in Sebes, expect temperatures between 19°C during the day and 4°C at night. On the 11th (Fri), you're off toSighisoara. Your day-by-day itinerary now includes Holy Trinity Church as well as Torture Museum. Kick off your visit on the 11th (Fri): see the interesting displays at Torture Museum. Get ready for a full day of sightseeing on the 12th (Sat): take in the architecture and atmosphere at The Fortified Church of Biertan, then don't miss a visit to Casa Vlad Dracul, then contemplate in the serene atmosphere at Holy Trinity Church, and finally appreciate the extensive heritage of Sighisoara Historic Center. For photos, other places to visit, more things to do, and tourist information, read our Sighisoara road trip planning tool . Getting from Sebes to Sighisoara by car takes about 2.5 hours. In October, daily temperatures in Sighisoara can reach 19°C, while at night they dip to 5°C. Cap off your sightseeing on the 13th (Sun) early enough to travel back home.